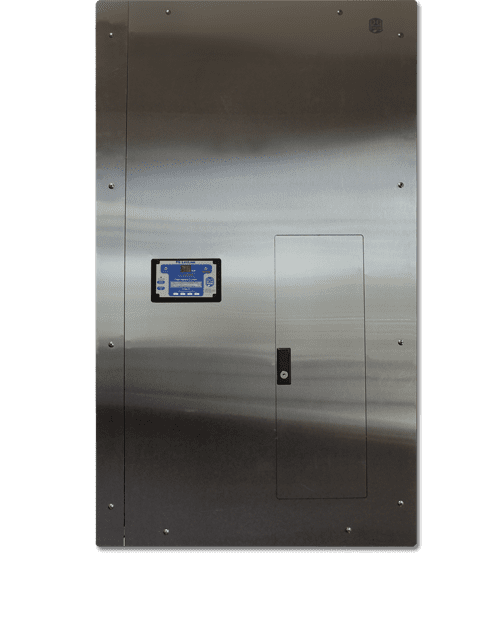 The Enhanced IPL Isolated Power Panel includes an industry leading 6” back box depth, a concealed hinged front, and is designed to supply power to remote Laser Outlet Modules located in multiple procedure rooms from a single, centrally located panel. This panel is typically installed in a hospital operating room or other procedure room designated for laser procedures. This is a cost-effective way to provide high voltage output to multiple locations from a single panel. Standard configuration includes a Programmable Logic Controller (PLC) system. This system protects against accidental overload and allows power to be selectively provided to the location needed. The outlet is energized by opening the receptacle cover, activating the contact switch and signaling the panel PLC to power the circuit. Once energized, the circuit is locked on until the device is disconnected and the cover is closed. The lockout feature can also limit the number of energized outlets, allowing the hospital to control the number of laser and/or X-ray procedures performed at any one time. Up to 12 outlets can be connected to the Enhanced IPL Panel. The number of energized outlets operated simultaneously is determined by the transformer capacity and the distance of outlet locations from the panel. The PLC protects against overloading the panel transformer. For more information, see design recommendations here. At least one Laser Outlet Module is required for each branch circuit supplied by an XTL panel. Standard configuration includes a Programmable Logic Controller (PLC) system.